The HELPER is a drone #MadeInLandes destined to help with lifesaving at sea. This drone is certified by the DGAC and allows the lifeguards to drop a self inflating buoy in close proximite to the victim in danger. The navigation information ( gps, compass, altitude. . .) helps to identify the exact location and difficulty that the victim is in which then aids the lifeguards, helicopters, jet skis and life boats. The drone HELPER with its high quality video offers an excellent recognition and visual of the victim and their surroundings. With its capacity to cover up to 2 kms, the drone will become a valuble asset for the lifeguards at the coast. 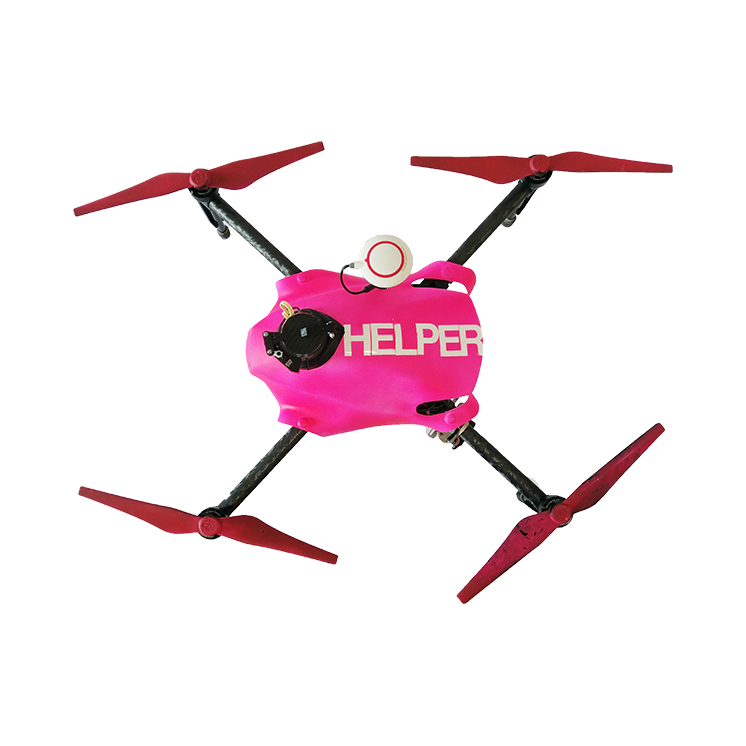 The HELPER is a piece of technology that allows a reliable and secure navigation. Ultra stable, he helps in the operation of life saving even in winds up to 50km/h. With its speeds of up to 55km/h and its precision to the metre it enables speedy and controlled interventions. The Helper climbs to an altitude of 10 m/s with a weight of 3.9 kilogrammes. The video it brings back in Full HD and Ultra HD allows a simple indentification and analysis of the victim and his surroundings. The drone certified for S1, S2, S3 has a parachute in case of breakdown. Finally it has a battery capacity of 15 to 25 minutes and so is capable of helping throughout the whole intervention. There are other functions to show after it has been fully patented. I am an emergency doctor for the SAMU 40 at Biscarrosse and also on the oil rigs, i am always interested in finding new systems and technologies that help get to potential victims quicker. I am passionate about new technologies, i develop and create innovative software for a variety of different professions. I lead projects in variable domaines : IoT , E-stock, E-health. I love working on different innovative projects and inputting my expertise.